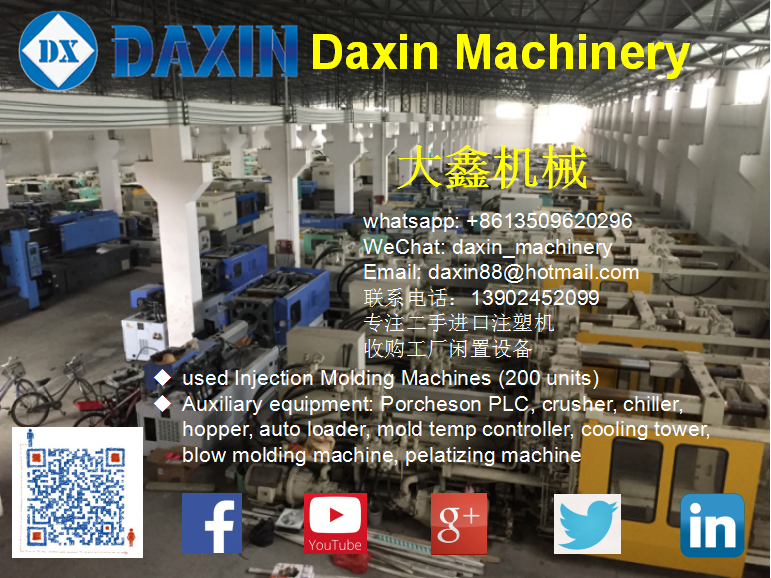 Daxin-Machinery: Over 200 Used Injection Molding Machines for sale. Auxiliary Equipment (new and used): Porcheson PLC, chiller, mold temp controller, auto loader, air compressor, material crusher, hopper dryer, water tower..
Service: Help customer buy spare parts, repair parts or PCB boards. Toshiba, JSW, Sumitomo, Krauss Maffei, Kawaguchi, Nissei, Mitsubishi, Meiki, Demag, Engel, Woojin, LG...etc. Haitian, Haitai, Victor, CLF, ChenHsong, Nangrong, HungTai, Multiplas, HwaChin, Kinki, Creator, FuChunShin, PoYuen...etc. Rich experience in export: one-stop solution including dismantling of machines, loading, moving, custom clearing (many agents cannot clear custom for used machines), shipment, assembling and commissioning of machines. All machines can be powered on for test-run. All machines can be viewed under one roof in our warehouse. Quality assured: All machines parts are checked thoroughly, including pumps, toggle, screw, barrel, oil seals, ball bearing, platen.etc. Any defective parts are repaired or replaced if beyond repair. Have exported to more than 30 countries : South East Asia, South Asia, Australia , Middle East, Africa, South America, Central America.